"'Fearing an uprising, the Sphinx sends Senlin to investigate a plot that has taken hold in the ringdom of Pelphia. Alone in the city, Senlin infiltrates a bloody arena where hods battle for the public's entertainment. But his investigation is quickly derailed by a gruesome crime and an unexpected reunion. As Senlin and his crew become further dragged in to the conspiracies of the Tower, everything falls to one question: Who is The Hod King?" Um, wow. There are so many things to say about this book and I'm not entirely sure where to start. I've really loved this series so far and somehow it continues to blow me away. I loved Senlin Ascends, though I wasn't quite as enraptured in the story of Arm of the Sphinx as I expected to be (though that could have been my fault for reading it at a stressful time in my life and I plan to re-read soon! ), but The Hod King...well, this was incredible. The Hod King is essentially split in three different parts, each following a different POV of our favorite characters who are all partaking in their own separate tasks. The first part we follow is that of Senlin's as he embarks to the ringdom of Pelphia on the Sphinx's orders and attempts to investigate things going on there (and perhaps find out more about his wife, Marya, as well). In the second part, we follow along with Voleta and Iren while they go undercover to find and potentially rescue Marya. And lastly we follow the beloved, powerful, and no-nonsense captain Edith as she commences her own path while in Pelphia. I'll admit, I worried a little that not all parts would be as interesting as the others--a common issue--but I'm pleased to say my worries were horribly misplaced because I loved every part of this book to bits. Senlin is one of the most interesting characters I've ever read. He has a very commendable sense of morals that always shine through, but he is also very human in his faults and breakdowns. A man can be pushed only so far before he begins to make brash decisions out of his natural character, and that is something that we get to see explored with Senlin, and it's also something that proves Senlin really is a fantastic character. Despite Senlin being the main protagonist, the other characters are just as prominent and shine just as brightly as him. Iren and Voleta are the best team I've ever seen, even though Voleta is almost always unable to contain her energy and drives Iren crazy. The care that they have for one another is simply remarkable. Edith continues to be an incredibly impressive woman who handles so much responsibility in such a deft manner and I'm really hoping to dive into more depth with her in the next book. One thing that was exceptionally prominent in this book was that this cast has so many female characters. And they're all so different! You have Iren, Voleta, Ann, Georgine Haste, Edith, Marya...I could go on. I loved it! Of course Senlin is a man and there are plenty of other male characters, but I have to say that the ladies really take the stage and are simply incredible. The best part is that it's not at all as though Bancroft thought, "hm, I need to make sure there are some female characters in this series," and threw them in just because. It is the exact opposite to me--these women have purpose, they are well-developed, unique, and full of varying motivations and personality traits. I was trying to think of the last time I read a fantasy in the vein of this book that has such a huge cast of women and honestly, it's a hard one, so thank you for that, Mr. Bancroft! One of the best things about Bancroft's writing is his attention to detail and the sheer care and precision he puts into every single scene. Each ringdom that has so far has been introduced is intricately created and described, with notable details that makes it all seem so real, and in Pelphia that was no different. It's yet another unique world in this ringdom, albeit it was one that I don't think I have any intention of ever visiting. 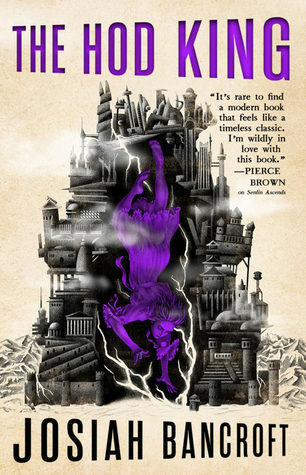 I don't have any idea how Bancroft manages to come up with all that he does in these books and I know that's how I tend to feel with all fantasy, but The Books of Babel just have so much and it somehow never feels like too much. There's enough detail and world-building to make it feel like a real place with real people and customs, but not too much to drag me out of the story or get bored with it. Another one of my favorite things is Bancroft's wit and cleverness. There are so many one-liners or conversations that had me chuckling aloud and reading them to whoever was near me (sorry to my patient husband and mom--although really, I'm only doing them favors). And for every humorous or witty comment that made me laugh, there were just as many surprisingly introspective or meaningful lines and passages that had me also getting out my sticky notes to mark the page. These books are fun and endlessly entertaining, but they're also important and full of thoughtful lessons and ideas to reflect on. You'll laugh, you'll cry, you'll feel angry at some characters and compassionate for others--reading these books is truly one of the best things that you can do for your health. The Hod King throws endless twists and truly unpredictable plot diversions at any and all times throughout this book. You may think you have it figured it out, but nothing is ever as it seems and you will surely be surprised at many intervals. Overall, I've given The Hod King five stars! I'm behind, I still need to catch up with Arm of the Sphinx, but I'm glad to see the series ends on a high note. Or, is this the end? There's one more coming! And I think the next one will be the last one, but I could be wrong.